It was back in 2004/5 that I first ‘discovered’ the wonders of fresh juice drinks. I was living in America and I’d often visit Smoothie King to get a juice instead of a drink. 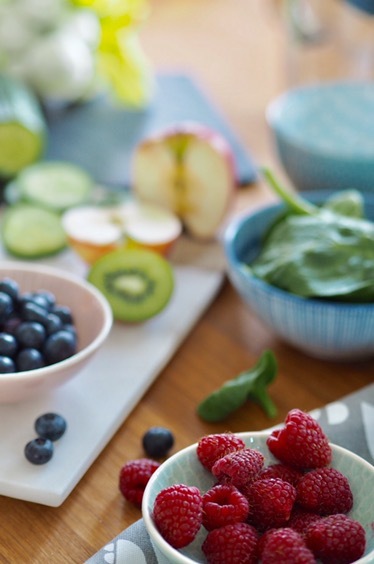 A fresh pressed or blended juice was always a nice option for a healthy sweet way to refresh. If I ever felt like I was missing some vitamins and needed a boost it felt like a quick fix. Ok, so one juice probably won’t fix a month of bad eating… but it had that effect of giving me that kick start boost. A habit I turned to over the years in London too for a shot of vitamins in between hectic life. However, since somewhat switching to suburban life, outside of central London – places to get a fresh pressed juice are few and far between. Of course I’m in central pretty regularly so can stock up on my juice cravings then. But what’s better than buying one? Being able to make them at home myself. Since I moved I am very guilty of falling out of some of my healthier habits. I’ve never been one to love exercise, but in London I had found things that worked for me and I did them fairly regularly. Where I live now, I haven’t quite found that routine. So with that missing, keeping my diet healthy has been pretty important and being totally honest – it’s still been far from perfect at times. In a bid to rectify this, at the start of 2017 I made a promise to myself that I’d make small changes through the year towards a healthier lifestyle. So no ‘right that’s it, I’m going carb free and running five miles every day before breakfast’. I’ve learnt a lot about myself over the years and know that big changes just scream ‘give up’ to me. Small changes are sustainable and realistic. I’ve had various smoothie maker or juicer type machines before and often have started meaning well and one thing or another has meant I’ve dropped the habit and fallen ‘off the wagon’ as such. 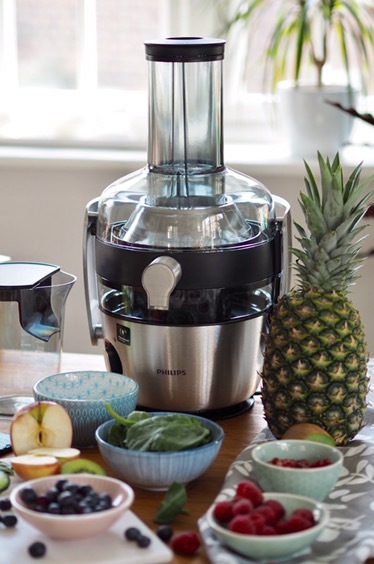 So what are the key things I look for in a juicer? It needs to be relatively compact so if it’s on the kitchen side it’s easy to use but not an eye-sore. It needs to be easy to clean. It needs to work well and be easy to use. I don’t want to be faffing around changing parts or causing chaos each time I need to clean it. If the parts go in a dishwasher it’s going to get major plus points. My own approach to the #HealthyHabitSwap was not to do just one of the swaps. But instead add a juice into my routine daily. Some days I’ve had it as an alternative to breakfast. Other days I’ve had one after dinner instead of reaching for a sweet treat. Other days I’ve replace my usual daily Diet Coke with a juice instead. I found a recipe called the ‘Instant Energiser’ that was a perfect way to feel like I was still mentally getting that energy boost as I would from the caffeine. I found that in a book called ‘Super Juice’ by Michael Van Straten that was a bargain that I picked up in Homesense early on in the#HealthyHabitSwap challenge that’s been perfect for coming up with juice concoctions based on either what ingredients I had, or the sort of juicy boost I’ve been looking for. 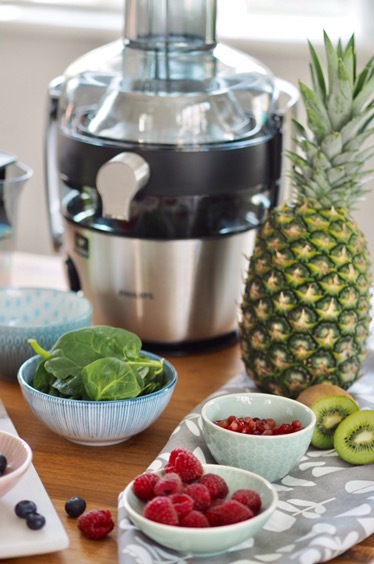 In case your wondering the Instant Energiser is super easy to make – the best thing about a juicer like the Philips Avance Collection Centrifugal juicer is the fact it works so well you don’t need to peel/prepare the majority of fruit too much at all. When I started the challenge I was using specific recipes. But as I went on, I started to get more of a handle on what I liked and started to just mix and match depending on if I wanted a green juice or something sweet. Mixing and matching more based on the overall flavour I wanted and what fruit or veg I had in the fridge. I found taking a more relaxed approach to what I was combining was the easiest for me. I was going to say ‘I don’t know what it is about a green juice that makes me feel so good’, but it’s sort of obvious… a green juice, when fresh pressed is basically packed with good stuff from green veg. So that’s probably why it makes me feel good as it’s essentially a glass of pure good stuff. Especially when you DIY, you know exactly what you have put in, so know there’s nothing but fruit and veg. No hidden sugar or additions to give it that taste. Every part of the juicer, other than the motorised base detaches and can safely be put in the dishwasher. 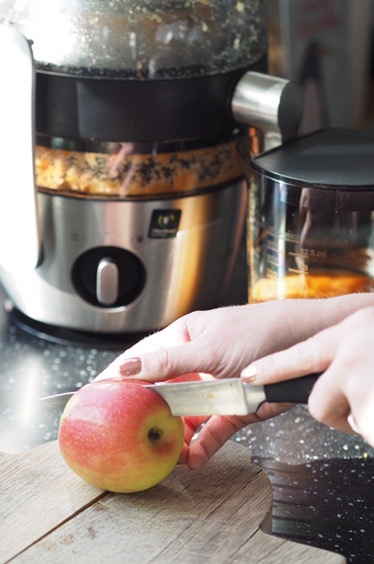 The juicer has an extra Fibreboost technology function to make sure as much fibre as possible makes it’s way into your juice and not in the waste product. BUT this doesn’t make it thicker at all. Still smooth and not lumpy at all – if that’s something that might not be to your taste (I like my juices smooth and more juice like than smoothie like). You can also use this function to flush the gadget through with water to give it a pre-clean before giving it a proper clean in the dishwasher. I’ve loved adding home made juices into my daily routine. It’s so easy and quick (from prep, to making the juice to cleaning up afterwards) that adding it into my day on even the busiest is so easy. Simply adding some core juice ingredients to your weekly shop (my most used have been carrots, spinach, apples and pears). You don’t have to at all but I did cut up the apple – purely because I didn’t like the idea of using the core! But you can pop them straight in and the juice is all that ends up in your glass! It’s been a much easier transition to adding juice in than I expected. Whilst I know my Diet Coke habit won’t be vanishing for good, I know that making juice a part of my day to day, that even on my most hectic days I’ll still have had a good boost of vitamins and minerals from good old fashioned fruit and veg. Yay, so pleased you love it too. Must try the instant energiser!